After a week in Rethymnon, where I stayed at the Varvara’s Diamond Hotel in Platanes, I have moved on to Georgioupolis (Γεωργιούπολη), where I am spending the second week of this holiday in Crete. 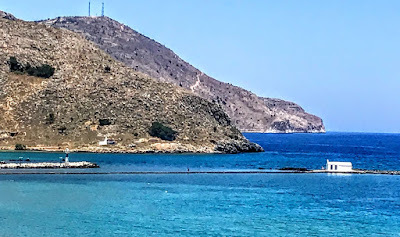 It was a 27 km journey by road late this morning from Platanes to Georgioupolis, which is about 22 km west of Rethymnon and 43 km east of Chania. It faces Almyros Bay, with Cape Drapano and its rocky coast to the north and the long sandy beaches towards Rethymnon to the east. 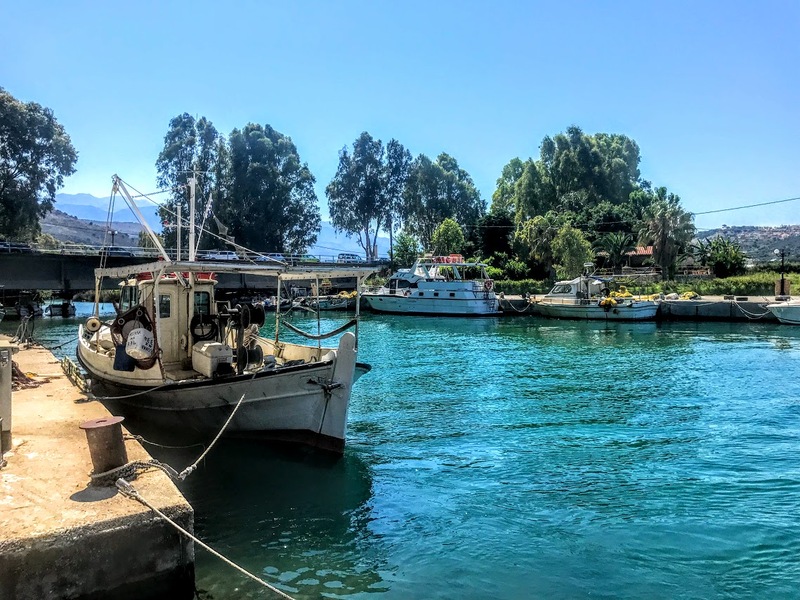 The town was once known as Almyroupolis but takes its present name from Prince George of Greece, who was High Commissioner of Crete in the last years of Ottoman rule. Archaeological evidence points to Georgioupolis as the site of ancient Amphimalla, the port of Lappa, a classical city at modern Argyroupoli. This was once a small fishing village. When Prince George was appointed High Commissioner of Crete in 1898, he changed the name of the village to the Greek equivalent of Georgetown, built a shooting lodge here, and had a vision of creating a Brighton of Crete in this place. However, his time on the island was shortlived. An autonomous island government was established, but Crete still technically remained under Turkish sovereignty. A revolt led by Eleftherios Venizelos forced the unpopular Prince George to resign in 1905 and Crete was united with the modern Greek state in 1913. Prince George’s vision for Georgioupolis never developed, and it was not until the boom in modern tourism that this became a popular resort, with many cafés, tavernas and small hotels. The broad main square with its eucalyptus trees is one of the most attractive in a resort in Crete. There is 9 km beach and a small harbour at the mouth of the River Almyros is used by small fishing boats and tourist boats. Just before the town, the river forms a small lake that is home to many birds and animals. At the end of the harbour, a small, decorative lighthouse is painted in the Greek colours of white and blue. The most popular sight in the harbour, however, is the tiny white-washed chapel of Aghios Nikolaos, which stands on a tiny islet at the end of rocky, artificial breakwater. I am staying at the Corissia Princess Hotel facing the sea and the fine sandy beach, and just a few steps away from the town square. This is a family-run hotel with 63 rooms spread over four floors. The roof terrace with offers 180 degree panoramic views over the bay of Georgioupolis, and the facilities nearby include a garden area with a swimming pool. Nearby attractions include Lake Kournas, local traditional villages and the White Mountains. But I may also take a day trip into Chania to wander around its narrow streets and alleys, or a boat trip into Soudha Bay.